Thanks to the CNOT, we can implement a xor-swap on a quantum computer. All we need to do is chain three CNOTs back and forth. The quantum equivalent of the one time pad (i.e. xoring a message with a secret key) is quantum teleportation. I would go into detail about how this works, but honestly it's just two quantum teleportations shoved together and this post is already way too long. Can someone provide more detail on just two quantum teleportations? Is there a generalization for $n$ quantum teleportations? The simplest way to generalize teleportation is to just repeat it. If you have one EPR pair divided between Alice and Bob, teleportation allows you to move one qubit from Alice to Bob (or vice versa) by consuming the EPR pair and using a classical communication channel. If you have two EPR pairs, you can move two qubits by performing two independent teleportations. If you have N EPR pairs, you can move N qubits by performing teleportation N times. In the case of the diagram you posted, what's happening is that there is one teleportation from Alice to Bob (to move the A qubit from the top to the bottom) and one teleportation from Bob to Alice (to move the B qubit to the top). 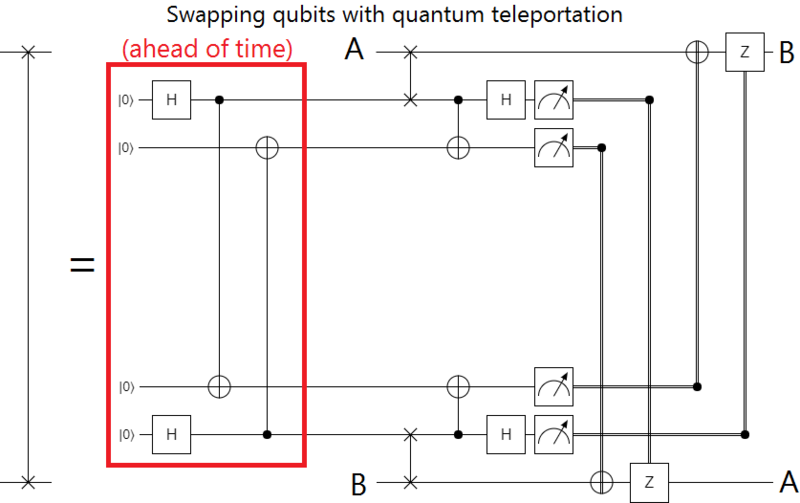 This is somewhat obscured by the fact that the teleportations' operations are being interleaved, and also the two swap gates that ensure the output qubits end on on the same lines as the input qubits. But it really is just two independent copies of the teleportation circuit, one from Alice to Bob followed by one from Bob to Alice, but "shoved together" (i.e. with the operations slid around so they interleave more). I suggest firstly reading up on famous 1935 EPR paper which should lead to some interesting thoughts about the nature of entangled quantum states. To then see how these thoughts are applied to Quantum Teleportation, I suggest page 26 of the all too famous Quantum Computing bible by Mike & Ike. Now since you can only measure once affectively what you must do is build a long chain of qubits and then entangle that so as to reach a "a generalization for $n$ quantum teleportations?" and as you can imagine that has its own problems given that for larger $n$ the more decoherence and interaction you're going to get in the system and each Qubit will need a minimum of 5 other Qubits to correct for such an error, so as you can begin to appreciate this is no simple task. Read more about this stuff here from people that know more about $n$ qubit Quantum teleportation in this paper. Hope this will give you some good resources to further your inquiry. Apologies for not being best suited to give a whole self contained answer myself. You can think of teleportation as the process of sending the state of one qubit from one place to another without having to physically send the qubit itself. Instead, you start with an entangled pair shared between the two locations, and that entanglement is consumed in the process. If you're not already familiar with teleportation, I strongly recommend that you find out about it. It's one of the basic building blocks of many results in quantum information. Of course, a swap gate is simply sending the state of one qubit from A to B, and another from B to A, which you can therefore do with two teleportations. So, how does this circuit work? Consider two locations, A and B. At each location, there are 3 qubits. So, at A, we have A1, A2 and A3. Before the start of the main protocol, we create two entangled pairs, one between A2 and B3, and another between B2 and A3. This is the stuff in the red box. For the main protocol, there is a one-qubit state (unknown) on A1, and another on B1. The aim is to swap them. The A1 qubit is teleported using the A2-B3 entangled pair, so the state arrives at B3. The B1 qubit is teleported using the B2-A3 entangled pair, so the state arrives at A3. A swap is performed from A3 to A1, and another from B3 to B1. Hence, the transmitted states arrive on the specific qubits they were supposed to be on. You can't quite follow that sequence on the depicted circuit diagram as the final swaps are actually performed a little bit earlier. That just changes which qubits some of the operations are performed on. Hopefully, you can see that this really is just 2 teleportations run independently to distribute the 2 different quantum states. As such, you can easily generalise it. If you have n parties, and everybody knows in advance where they will be sending their qubit, then, again, each party can manage with just 3 qubits, and they will share two entangled pairs, one with the user they'll be receiving a state from, and one with the user they'll be sending their state to. Now, if you don't know in advance where each party will want to send their qubit, you could make it so that each location has $n$ qubits: $n-1$ with entangled pairs shared with every other party, and one with the qubit state to be sent. But that is highly inefficient in terms of resources, and it is an interesting question about how little entanglement is actually necessary. I assume this has been answered somewhere, but I don't know where off the top of my head. Not the answer you're looking for? Browse other questions tagged quantum-information resource-request circuit-construction teleportation or ask your own question.